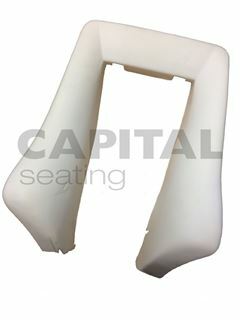 Replacement backrest bolster foam for the RECARO N-Joy and Specialist seats, suitable for a range of OEM RECARO seats. This is a genuine aftermarket RECARO foam section, that will suitably fit a number of seats. In some cases, the profile of the foam may differ slightly from the OEM foam, however this is the closest match available in the market today. The foams will suitably fit the original seat frame and provide a quality fit. For additional styling, you may wish to add extra padding within the bolster cover, or make modifcations to the seat foam to achieve the finish you require. The majority of N-Joy seats utilised a backrest bolster foam which was more bulbous in the lower sections than as the one shown in the image here. Those foams are no longer manufactured and we are unable to source them. This outer backrest foam will fit to the seat frame and act as a suitable replacement, but you would need to modify your seat fabrics in order to achieve a tight finish. Copyright © Swann Systems (UK) Ltd. All rights reserved.